The combination of Peter Cottontail, mounds of Easter eggs and bright sunshine attracted an estimated 1,000 keiki to the 19th Annual Biggest Easter Egg Hunt held last week at Wong Stadium in Hilo. Sponsored by Hawaii County’s Department of Parks and Recreation, the Hilo Jaycees and the Hilo High School Key Club, Friday’s free event featured age-group egg hunts, crafts, food-eating contests and pictures with the Easter Bunny for children between the ages of 3 and 12. The festivities were made possible through support from the Hawaii County Office of the Prosecuting Attorney, Police Department, Hawaii Police Department, the Waiakea High School Key Club, Hilo and Waiakea Intermediate Builders, Hopaco, Circle K, East Hawaii Kiwanis, and the Men of Pa‘a. 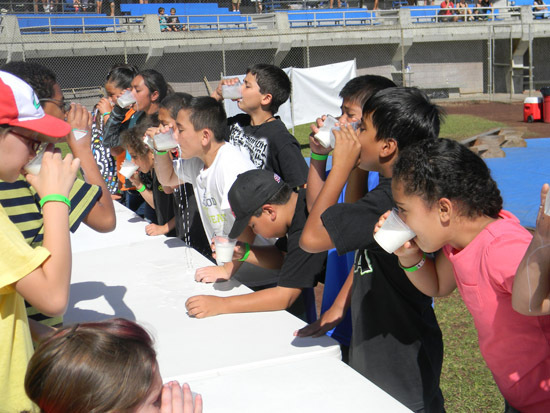 The Biggest Easter Egg Hunt, along with several others the Department of Parks and Recreation held around the island during Easter weekend, is one example of the varied drug-, alcohol, and tobacco-free recreational events conducted for the benefit of Hawaii Island’s growing population.